It’s a new year and that means organizations are gearing up to fine-tune the operational aspects of their company. HR generalists all over the nation are ticking the boxes to ensure compliance—and for many, configuring an Affirmative Action Plan (AAP) is part of that equation. 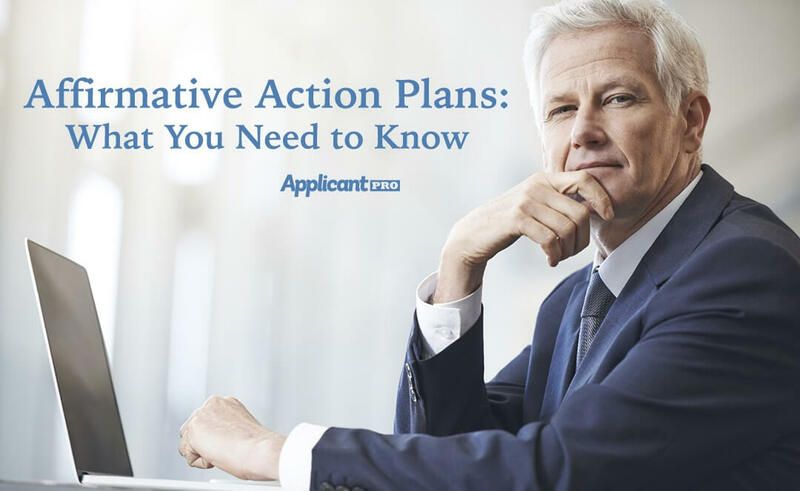 Most organizations use the calendar year to begin their plan, so now is a critical time to get started on the affirmative action front. Creating an Affirmative Action Plan has its tricky moments, as many organizations are not sure if they need one or what it takes to put a solid plan into motion. Not sure where to begin? First, let’s start with who needs an Affirmative Action Plan. The Vietnam Era Veterans’ Readjustment Assistance Act of 1974 (VEVRAA), as amended by the Jobs for Veterans Act, requires contractors to take affirmative action to employ and advance in employment veterans with service-connected disabilities, recently separated veterans and other protected veteran. VERVAA requires that employers with contracts entered before Dec. 1, 2003 who also have 50 or more employees and contracts of $25,000 or more would be required to take affirmative action. Those with 50 or more employees and $50,000 in federal contracts would be required to have a written affirmative action program. For contracts entered on or after Dec. 1, 2003, contractors with 50 or more employees and a contract of $100,000 or more would need a written affirmative action program. Under Executive Order 11246, federal contractors and subcontractors with 50 or more employees who have entered into at least one contract of $50,000 or more with the federal government must prepare and maintain a written program, which must be developed within 120 days from the commencement of the contract and must be updated annually. The program should cover recruitment, hiring and promotion of women and minorities. Any depository of government funds in any amount or any financial institution that is an issuing and paying agent for U.S. saving bonds and savings notes in any amount must develop and maintain written affirmative action programs as well. Executing a good Affirmative Action Plan has several benefits. A study conducted by University of Illinois professor Dr. Cedric Herring in 2009 analyzed more than 1,000 American businesses, and Dr. Herring found that employers with diverse employee pools have stronger bottom lines, the result of a stronger customer base, a larger market share and higher sales revenue, all of which resulted in higher profits. This means the better the plan, the more likely the organization succeeds. On the other side of the coin, it prevents organizations from being out of compliance, which can garner penalties, sanctions, and even revocation of government contracts. While the benefits are clear, creating a solid Affirmative Action Plan can be tough for your already busy HR team. Creating an Affirmative Action Plan has its obstacles. For starters, states and federal laws have different requirements. If your organization operates on a multi-state level, there may be different hoops you need to jump through to ensure full compliance. Of course, the process does not have to be a manual one as many companies adopt technology to mitigate the cumbersome task of solidifying their plans. The beauty of software is that it takes away the tedious nature of manual tracking. Need a plan that covers all of the bases? Use software that can customize your employment application and allow your applicants to self identify their race, gender, veteran status and more at point of application. This takes away the headache of manually tracking without having to dedicate manpower to get it done. An Affirmative Action Plan is not a new phenomenon, but it can trip up even the most astute organization. The New Year brings great opportunity for organizations to hit the ground running. Get off to a strong start by firming up your Affirmative Action Plans. Start by determining if an Affirmative Action Plan is right for your company and mitigate the process by allowing tech solutions do the heavy lifting. By being proactive, you lessen the risk of being out of compliance while giving you the peace of mind by getting the job done right. href='https://www.applicantpro.com/glossary/applicant-tracking-system/'>applicant tracking system of the 21st century. It’s been through many changes and will continue to evolve as technology does. But it’s safe to say that the applicant tracking system of today is better than it’s ever been before. Today, the applicant tracking system can be one-stop shop for all of your hiring needs, with integrations. The very basics of the system, is that it does exactly what it sounds like: track applicants. Applicants use the ATS to apply for a position with your company and the system collects and stores all of their information via the cloud. It provides all of the necessary components you need to sift through your applicant pool and hire the most qualified candidate for your open position. With the applicant tracking system, there is no longer the need for paper applications or having to sift through countless emails of resumes and other requested material. Everything you need is available in one place, all the time, anywhere you need it.